The BBC has featured old photographs found in a skip that show one of Scotland’s most important public works, the Katrine acqueduct, being built. 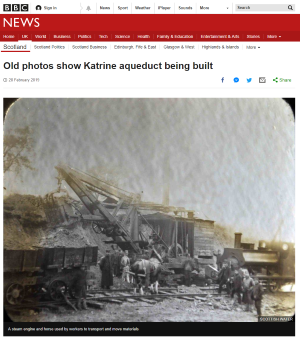 The photos show the construction of one of the Katrine Aqueducts, which take water to treatment works that supply 1.3 million people around Glasgow. The aqueducts were part of a radical 19th Century plan to supply fresh water from Loch Katrine to Glasgow, 35 miles away. The glass photograph slides show work on the second phase of the project, which began in the 1880s. The slides were thrown out when Scottish Water’s former west of Scotland offices, at Balmore Road in Possilpark, Glasgow, were being closed. The first aqueduct includes tunnels through mountainous terrain in the shadow of Ben Lomond and bridges over the valleys. A second aqueduct was constructed decades later to accommodate the rapid expansion of Glasgow… The entire Katrine Aqueduct scheme cost £3.2m to build which would be about £320m in today’s prices. 1902 – Loch Arklet bill passed to build a dam and divert the water to Loch Katrine via a tunnel. 1903 – Glen Finglas Act passed to allow the water from Glen Finglas to be diverted to Loch Katrine, not taken up until the 1950s. 1909 – Loch Arklet dam construction started. 1914 – Loch Arklet dam and associated works completed. 1919 – Act to further raise Loch Katrine level passed. 1929 – Level of Loch Katrine raised by increasing the height of Achray dam and the dam around the inlet for the aqueducts. 1958 – Glen Finglas tunnel to Loch Katrine completed. 1965 – Glen Finglas dam completed.